You’re invited to the Brooklyn Navy Yard Holiday Market, where I’ll pack up artwork from my studio and set up at a booth Saturday and Sunday, December 1-2 from 12-6pm. 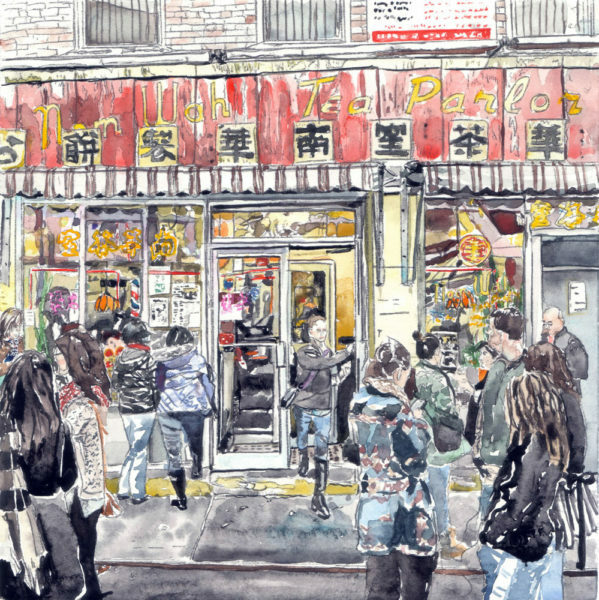 I’ll have framed archival prints from my Chinatown series, like the Nom Wah Tea Parlor gouache painting pictured above, new watercolor paintings, and prints from my “Nick’s Lunchbox Service” series available. Please stop by and say hi in Building 77, and check out the other three dozen artists and local small businesses based in and around the Brooklyn Navy Yard that will be at the holiday market. By the way, the Brooklyn Navy Yard is home to over 400 manufacturing and creative businesses representing over two dozen different industries. From woodworking and metal fabrication to fashion and electronics, the Yard is a diverse ecosystem where thousands of products are designed, built, crafted and constructed each year.